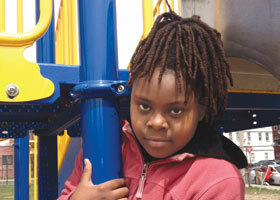 Jalyssa is now nine years old and is on a daily regimen of inhalers to keep her severe asthma at bay. Each night, she takes one puff from Advair, a long-acting inhaler, and she has an albuterol inhaler that she takes as needed throughout the day, including before recess and gym. Lots of things can trigger Jalyssa’s asthma, including cold air, weather changes, illness and any number of allergies. Her most concerning allergy is to peanuts (her mom and the school nurse must also keep an EpiPen—injectible epinephrine—on hand in case of any accidental peanut exposure), but she’s also allergic to two different types of grass, dust mites, roaches, cats, dogs, horses, beef and corn. The mom says she’s seen lots of other kids and adults with asthma in her urban, largely minority neighborhood. “I don’t know what’s triggering it, but it’s becoming common,” she says. African-American children have the highest rates of asthma in the U.S., with 21% under the age of 18 having been diagnosed according to the most recent statistics from the Centers for Disease Control and Prevention. Hispanic children are the next most impacted, with 15% diagnosed compared to 12% of white children. A family’s economic status plays a role, too—poor families are more likely to have a child diagnosed with asthma. Across the U.S., asthma rates continue to climb, with an additional 4.3 million people diagnosed between 2001 and 2009, for a total of 25 million people with asthma. Among black children, there was a 50% increase in asthma diagnoses during those years. Staff members now routinely approach families of patients who come to the emergency room for asthma treatment and offer to enroll them. Over the course of 12 months, these staff members visit the family’s home, provide a walkthrough inspection, identify triggers such as mice droppings, cockroaches or clutter; offer integrated pest management solutions (plugging holes, covering trash cans); and provide materials where needed. And CAI staff give every family a HEPA vacuum—one with an air filter that removes 99.97% of all particles greater than 0.3 micrometers. The program is working. An evaluation of the success of CAI published in Pediatrics in March 2012 noted that at the 12-month follow-up children enrolled in the program had 68% less emergency room visits and nearly 85% less hospitalizations. The kids were playing more and missing school less and parents were clocking more days at work. Boston Children’s Hospital was spending less, too—for every dollar spent on the program, the hospital saved $1.46 in expenses. Kids in cities aren’t only subject to more triggers inside older apartment buildings—they are also impacted by the nitrogen dioxide and particulate matter produced by power plants and highways and by high ozone levels. Ozone is created when nitrogen oxide collides with volatile organic compounds in sunlight. This ground-level ozone frequently reaches unhealthy levels in cities on hot days and makes the air more difficult to breathe. Short-term ozone exposure also causes coughing, throat irritation, chest pain when inhaling, chest tightening, wheezing and shortness of breath, according to the U.S. Environmental Protection Agency (EPA). While there is a national push to “leave no child inside” and encourage more outdoor exploration and play, for kids with asthma in high-pollution, high-ozone environments, the outdoors present a major health hazard. 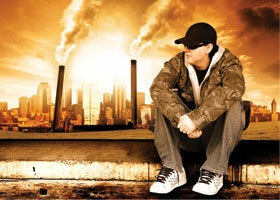 And the younger children are, the more susceptible they are to the damaging impacts of pollution and ozone. Skyrocketing summer temperatures combined with the country’s worst drought since the Dust Bowl made 2012 a record year for wildfires. More than nine million acres burned across the country, an area the size of Massachusetts and Connecticut combined. It was only the third time such numbers have been reached since record-keeping began in the 1960s—the other two years were 2006 and 2007. Colorado was one of the worst-impacted states, as well as New Mexico and Oregon. Global warming is not only driving more intense and frequent wildfires, but the fires themselves release large stores of carbon from forests, contributing to that warming. A report by the National Wildlife Federation notes that “In some western states a fire spanning over just a couple months can emit nearly as much carbon dioxide as its total annual fossil fuel emissions.” The environmental organization projects that overall burned areas will double by late this century across 11 western states, with Montana, Wyoming, New Mexico and Utah expected to be particularly hard hit. And, Pinkerton adds, “Even thunder storms can cause problems with asthma,” noting that the storms can release additional pollen. 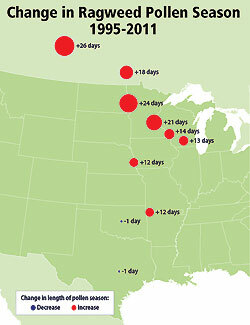 The EPA has been studying changes in ragweed pollen seasons at 10 locations across the U.S. and Canada since 1995. At eight of the 10 locations, ragweed pollen season has increased. The greatest increases are in the northern latitudes, such as Fargo, North Dakota (increased by 24 days) and Saskatoon, Saskatchewan (increased by 26 days), consistent with global warming trends. Ragweed pollen is potent—and about 26% of the population has a sensitivity. Children and the elderly are particularly susceptible. Researchers have long been at work on a ragweed vaccine that works by attaching a synthetic piece of DNA to the allergen. Like traditional allergy shots, these work by gradually building up a person’s immunity so the body no longer overreacts to exposures with histaminedriven itchy eyes, sneezing and shortness of breath. A study released in March 2012 reported success with a dissolvable pill form of the ragweed injections. More than 500 adults with ragweed allergy were given either the tablet or a placebo. Those taking the tablets at the highest dosage had a 17% reduction in symptoms during the peak of ragweed season. These mitigation strategies cannot come soon enough for asthma sufferers. A 2006 report on the increase in pollen production expected from rising CO2 levels that appeared in Environmental Health Perspectives, noted that pollen allergens act together with particulate matter from car and truck exhaust to make asthma conditions worse. And these pollen levels are leading to increased emergency room visits for asthmatics. A study looking at pollen levels and emergency room visits between 1993 and 2004 in Atlanta found there was a 10% to 15% increase in asthma-related emergency room visits on the highestpollen concentration days. 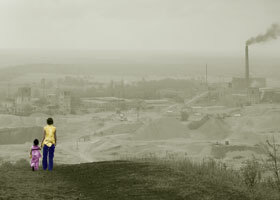 Other environmental exposures are impacting asthma rates, too. Exposure to phthalates, chemicals used to soften plastic that are in children’s toys and PVC flooring and build up in household dust, was found to have an association with asthma and allergies in children. And in March 2013, researchers from Columbia University released findings that postnatal exposure to bisphenol A (BPA), a chemical used in plastic bottles and food containers and in the epoxy resins lining food cans, was associated with a risk of wheeze and asthma. This increased risk was seen at “fairly routine, low doses of exposure to BPA,” said lead author Kathleen Donohue in a related release. Asthma is one of a host of health consequences from climate change, Balbus says. “If you look at the science, increases in temperature and sea level rise are expected to speed up over time and the consequences become more alarming” he says. 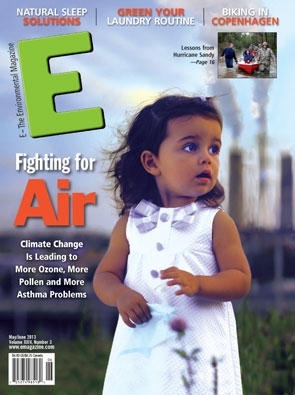 “There’s an urgent need to limit climate change not just for asthma but for the overall health and well-being of a growing population over the long term.” That said, he adds that burning less fossil fuels would not only reduce global warming-causing emissions, but also bring immediate benefits in the form of cleaner air for asthma sufferers. People can stay abreast of air quality in their region via the EPA’s air quality index called AirNow. 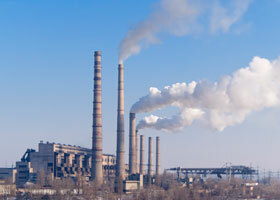 The rankings—from zero to 500—reflect how clean or unhealthy the air is based on the presence of five major pollutants: ground-level ozone, particle pollution (or particulate matter), carbon monoxide, sulfur dioxide and nitrogen dioxide. A ranking of 100 represents the level established by the EPA as acceptable for public health—so rankings below 100 are good, while above 100 are unhealthy. The rankings are also color-coded: green (0-50) for good; yellow (51-100) for moderate; orange (101-150) for unhealthy for sensitive groups; red (151-200) for unhealthy; purple (201-300) for very unhealthy and maroon (301-500) for hazardous. The agency notes that air quality values above 300 are “extremely rare” adding that “they generally occur only during events such as forest fires,” a particular worry as climate change increases the frequency of such fires. They add that ozone is worst in warmer months and carbon monoxide is likely to be a problem during morning and evening rush hours. People can stay updated with real time air quality information on the website airnow.gov or download the free AirNow app. The site enviroflash.info allows people to register for these air quality updates to be sent to their inboxes. On poor air quality days, the EPA advises people to protect their health by limiting very prolonged or very active outdoor activity such as yard work or running.